It’s fall and it’s pumpkin and winter squash season! The winter squash looks so good in the store and I really wanted to incorporate it into my cooking this weekend. 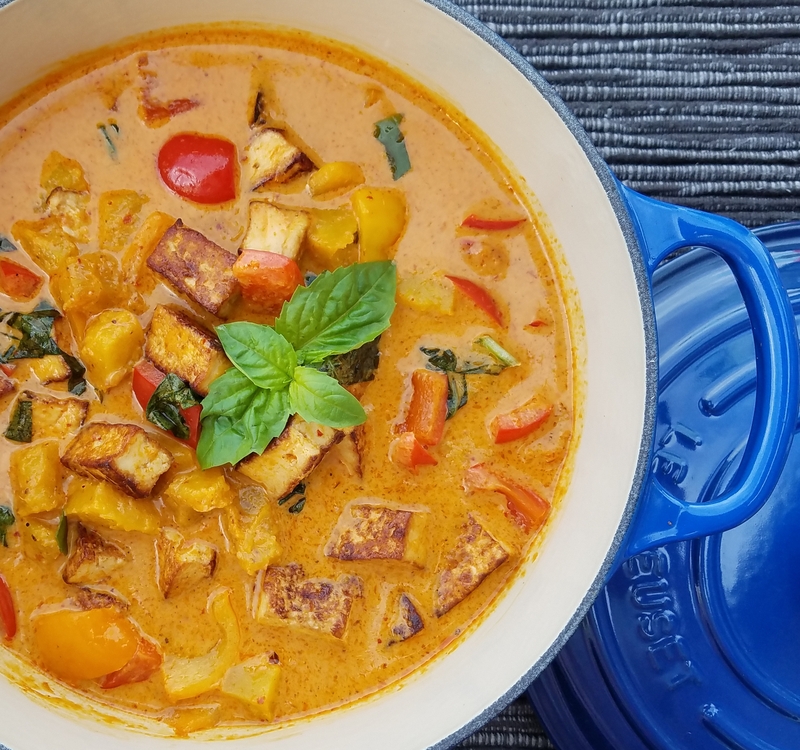 I decided to try the Delicata squash in Thai Red Curry along with a few other colorful bell peppers and tofu. It took a little more prep time roasting the squash and pan frying the tofu, but the curry turned out beautifully. We all enjoyed this heart-warming dish along with fragrant jasmine rice. Toss squash cubes with olive oil and pinches of salt and pepper. Arrange in a single layer on a lined baking tray. Roast for 20 minutes until softened. Check at 5-minute interval, shake the tray to so that the squash do not stick to the lining. Do not overcook in the oven, as it will be cooked further in the curry. Mix tofu marinade in a bowl. Drain and cut tofu into 1/2 inch slices. Lay flat in a tray and pour marinade over the tofu. Remove tofu from refrigerator, pat dry and cut into 1/2 inch cubes. Heat 2 Tbsp of oil in a skillet over medium high heat. Pan fry the tofu cubes until lightly charred on all sides. Remove from pan and set aside. In a medium pot, heat remaining 2 Tbsp of oil over medium heat. Fry curry paste until fragrant. Add 1 cup of coconut milk and 1/2 cup water and bring to a boil. Add the bell peppers and kaffir lime leaves. Simmer until peppers are soft. Add the remaining 1/2 cup coconut milk, fish sauce, and coconut sugar. Adjust seasoning to taste. Stir in roasted squash and tofu cubes. Bring to a boil again.